Leather is the armor of choice for assassins and rogues for a reason. Not only can it help to ward off sword-blows, but it is also light and flexible. Those qualities are well preserved in this Behan Breastplate and Pauldron Set and its roguish design. Crafted entirely from rigid 9-10 oz. buffalo leather, this armor is strong enough to provide all the protection that a rogue might encounter, while also light enough to let any warrior retain all the mobility and agility that they desire. 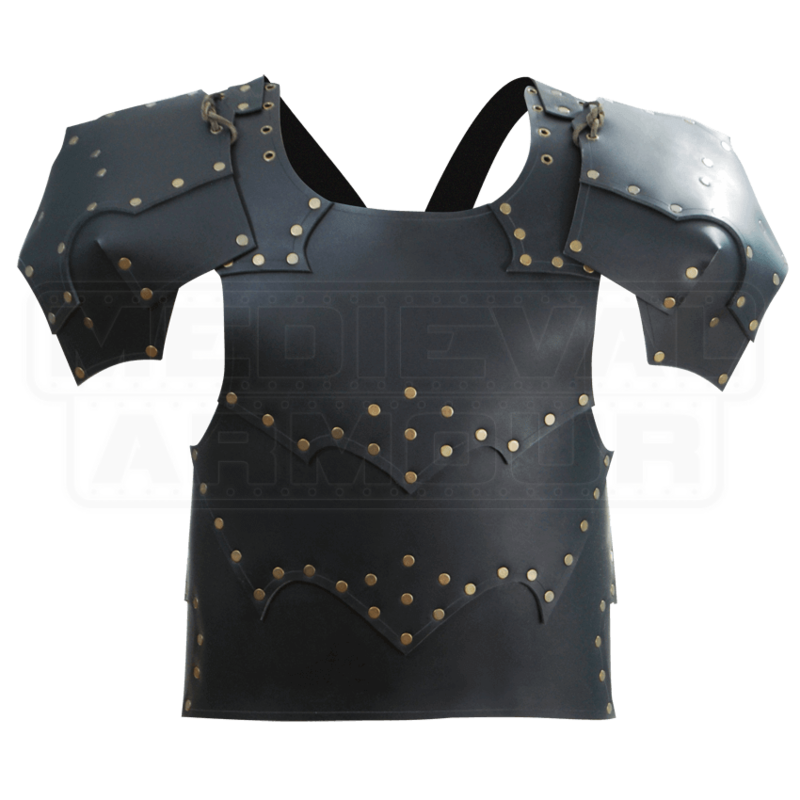 The armor is a lamellar style breastplate, consisting of shoulder straps attached to lames, or wide leather bands, which are layered horizontally down the core to create a strong and solid defense. The edges of these leather bands are stylized with edged shapes and secured with riveted patterns, which not only enhances its strength and durability, but also infuses an element of style and fantasy into the armor, as well. The end result is that this breastplate will provide solid protection, as well as an impressive overall look. True to its name, the Behan Breastplate and Pauldron set also includes a pair of matched pauldrons. 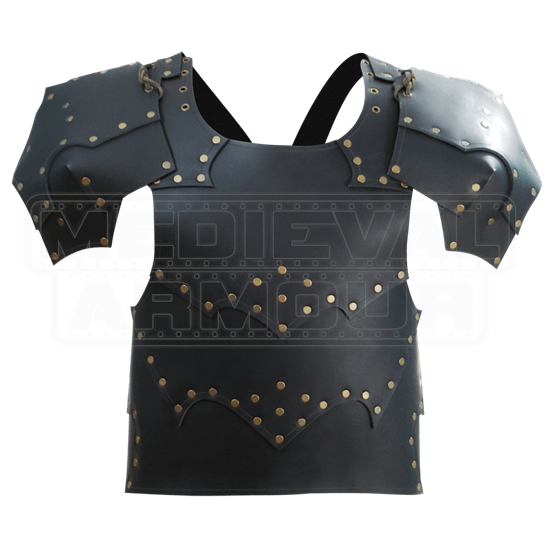 Made from the same leather, in matching layered design, these shoulder defenses keep the upper arms safe from harm, while also complementing and enhancing the overall look of the armor, as well. They are secured to the shoulder grommets using leather lacers. It is available in four sizes, and each size features a quartet of leather straps with buckle closures for wearing. One strap each goes over each shoulder and crisscrosses over the back, while the last two secure around the back. Because it fits more around the waist than the chest, the armor is sized according to the waist, as opposed to the chest. The lightness of this Behan Breastplate and Pauldron Set makes it a gem for nimble warriors, who prize agility, stealth, guile, and skill above all else. Its overall look ensures that even if a mark, target, or bystander should see you, it is a sight that they will not soon forget. just received this today. love the design and quality. the shoulder pauldrons take some time to adjust and float a little but not a problem. again this item runs a little big, i had to use a leather string to pinch the shoulder straps together so they didn't slide off. made for a broad shouldered guy/girl but otherwise a great product. the price isn't bad for what u get either! !